One of the things Git and version control systems do not capture are the details about the actual hardware used to develop the code, or how testing was performed. 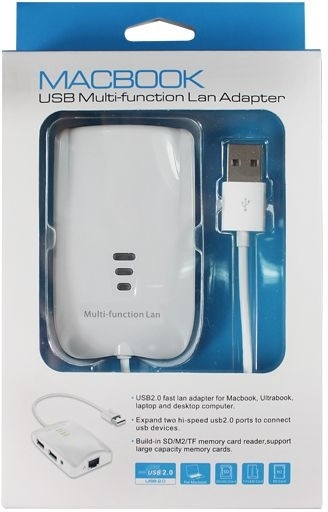 First I used a Combo Adapter (Although its called MacBook, it is an ASIX AX88772A device that works with everything from Windows 98/ME through Windows 7, and OSX 10.3 through 10.7 and Linux 2.4 or better) so its about as flexible a device as your likely to find. On one side it has two USB ports, so its a mini-hub, and has a power connector in case you want to power it. On the other side are a number of memory card ports, including SD/M2/TF(microSD). Carrying this out to its extreme conclusion, my hope was that most Laptops and Notebooks without an Ethernet port would have at a minimum a USB port, which could then be used with a Multi-function device like this to attach additional Flash memory devices or memory cards. Now that gPXE has been proven to activate and PXE over [ http ] from this device (which opens up iSCSI, AOE, https.. and of course tftp). The next logical step would be to see if if could be written to a memory card, then inserted and booted from. The boot feature would only require the Laptop or Notebook at a minimum support the USB hub type and to recognize a memory card or flash drive as a bootable device which many in Legacy mode will do. The diverse form factor of the ports means boot media could be collected in one form and either used directly in a Laptop or Notebook port or in the Combo device itself. 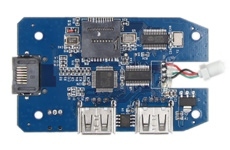 This is a complete linux type computer with a dhcp server, router and firewall in a tiny form factor, and its is bus powered. In fact since it contains all the server and WiFi componets to support ad-hoc networking, it could be attached to the end of the Combo adapter above and provide a Wireless bridging function to boot off a WiFi enabled infrastructure. One end is an Ethernet plug, the other end is a USB pigtail type connector.. so it could be attached Ethernet-to-Ethernet or Daisy chained off the Combo adapter USB hub.. but I tend to think E-to-E would be a faster thing to do. If all of three components could be packaged into a single chip form factor.. the result would be something as useful as USB universal communications adapter.. which could be used either to retro-fit older computers with modern facilities for remote booting.. or uploading and backup.. diagnostics, provisioning.. forensics.. or on the spot networking of a node cluster in short order. One of the things Data Centers today still have a problem with is node bridging and the inherent lack of thought that goes into network pathing.. if its merely a chip on every motherboard like an ipmi, bmc or ilo.. that becomes a lot less of a problem. For consumers.. devices without brains (DWB) or "DWeeBs" could become very attractive as their prices fall and "form factor" takes an even more forward position in their value and design.